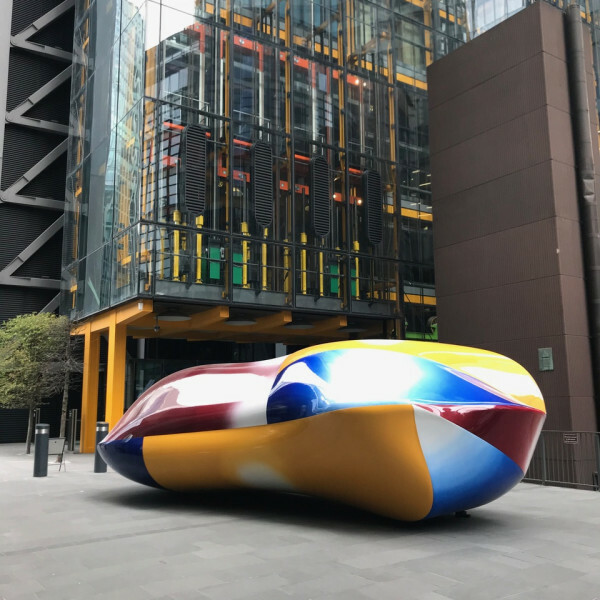 Jean-Luc Moulène's Body (2011) is included in this year's edition of Sculpture in the City, the annual public art programme in the Square Mile of London. Inspired by automobile design and produced at the Renault factory, Body (2011) is an aerodynamic form composed of twelve sections, each painted in gradations of the three primary colours. The Secession Knot (5.1) is a site specific intervention by Jean-Luc Moulène. 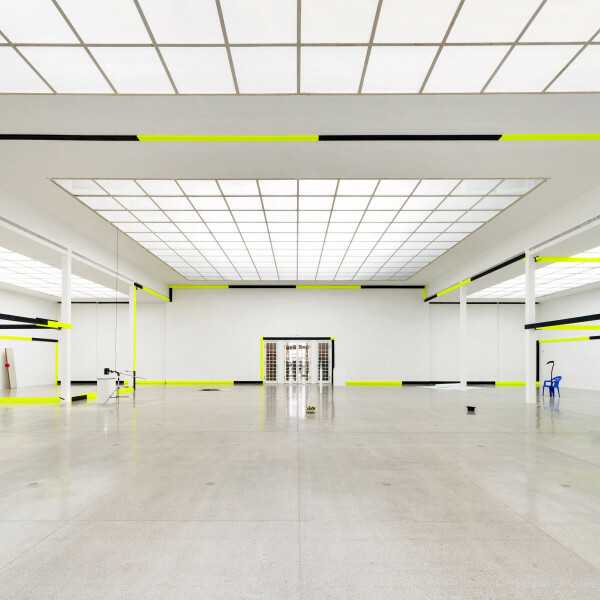 Timber panels painted pitch black and neon yellow form a "knot in space" that engages the architecture in dialogue while establishing "spaces" with different qualities in which Moulène presents additonal works. 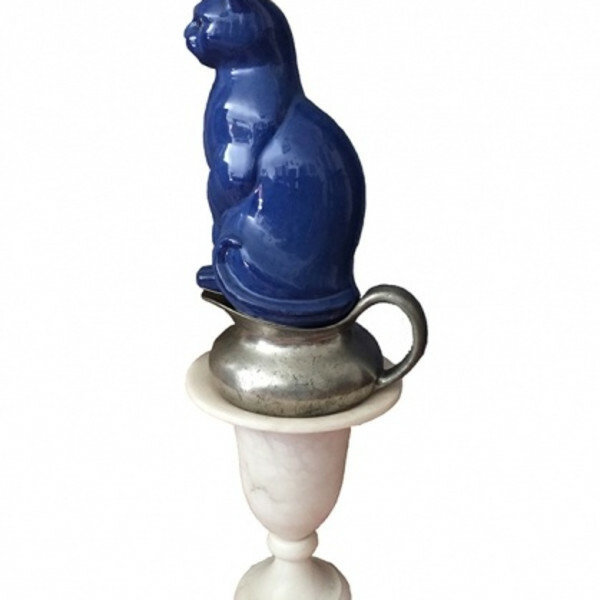 Most of these objects were conceived specifically for the Secession and relate to the overpainted newspaper images Brèves from his artist's book to be published in conjunction with the exhibition. Jean-Luc Moulène in conversation with Corinne Diserens. 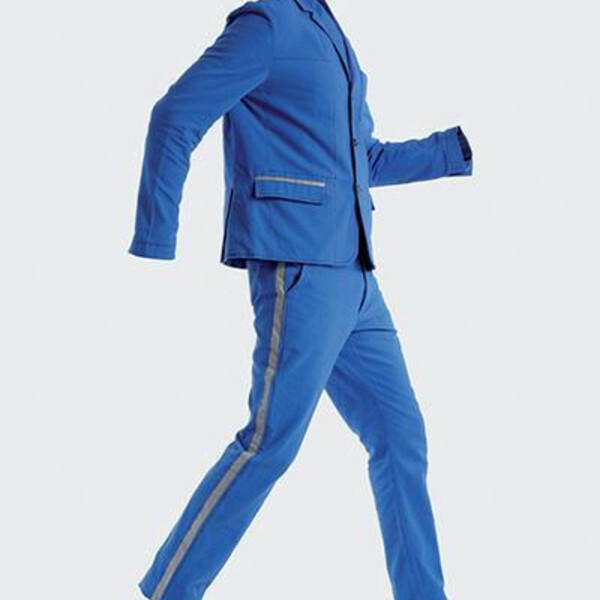 On 12 December 2013, Extra City Kunsthal presents ENDWARDS, a project by French artist Jean-Luc Moulène. Articulated around three new productions, the exhibition includes a condensed retrospective, exploring genealogies for the new works and recurrent questions in the artist's practice. 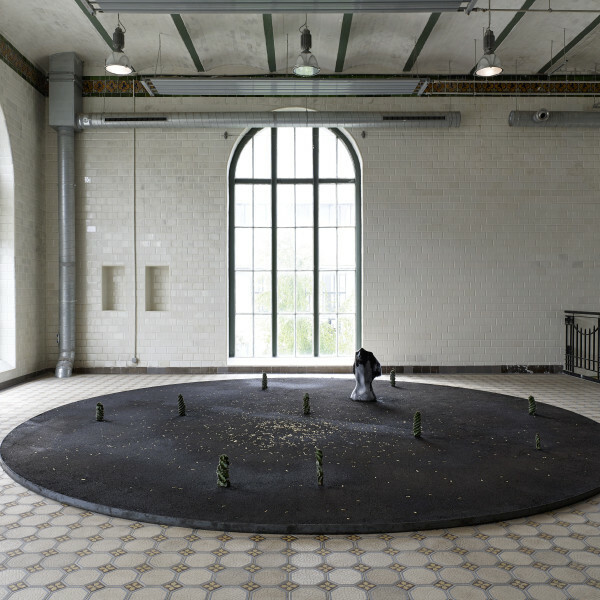 ENDWARDS looks at the coextensive operations that configure Moulène's objects and images, at the ways in which these intersect time and materiality, erosion and resistance: at the connections between 'building a body for oneself', as the artist defines the focal point of his work, and his radical avoidance of a signature style. In sculpture as in photography, Jean-Luc Moulène constructs and documents situations akin to Zeno's paradoxes: that disunite media, genres and their strictures, or that confuse authorship, delegation and 'co-production' - with materials and circumstances. Among the new commissions, the sculptural assemblage Usure (Wear) references building techniques in pre-Colombian architecture. One explanation for the robustness of megalithic walls such as that of Sacsahuaman in Cusco, Peru, is that systems of cranes and pulleys, and considerable amounts of physical work, were employed to rub the stones against one another until they became seamlessly joined, making unnecessary the use of mortar. Usure applies this method to three life-size sculptures: through distinctly oriented rotating and swinging motions, a male bust, a female figure and a vulture abrade each other into figurative and temporal appeasement. Somewhere between a collage of antagonistic positions and the metonym (or residue) of a convulsive history, Usure cuts across museological and political spaces: it moves from discrete objects, each with its caption and fixed role in narratives of 'identity', to collapsed distinctions and crossbred figures, both uneasy and stilled. The maquette Pleasure Dome departs from observations of architectural ruins in Greece - new or old, quasi-mythological or late-capitalist, enshrined as relics or abandoned to the elements. Made of as many minute bricks as will be required by the future construction of the actual work (to measure 3,20 meters in diameter), this model of a ruin has an intact dome as inner surface, sheltered on the outside by a jagged, broken geometry of bricks. The two sides of the object articulate an imaginary story of preservation and ravage, where the contemplative, conciliatory purpose of the dome contrasts with the inscrutable force that ripped the dome out from an ampler construction, whose outline or function we can no longer discern. As postscript to the imaginary narrative activated by the model, the work is to be immersed in the sea for an undetermined duration: thePleasure Dome will be finished only once its angular, toothed brickwork will have been smoothened by the mechanical and chemical impact of the waves. A spatial drawing completes the trio of scalar relations that structure the exhibition. Dessin asservi (Subordinated Drawing) reproduces at the scale of Extra City Kunsthal's main hall the intersection of a sphere and an ellipsoid, registering on walls, ceilings, floors and pillars. The work makes use of a simple gardening technique - transformed, but not exalted, by volumetric expansion -, and echoes Moulène's long-standing interest in the sinuous dynamic of knots and Borromean rings. Taking possession of the entirety of the space available to it and theoretically capable of extending its marks beyond it, the work is a homeless drawing and the locus of a permanent inadequacy. 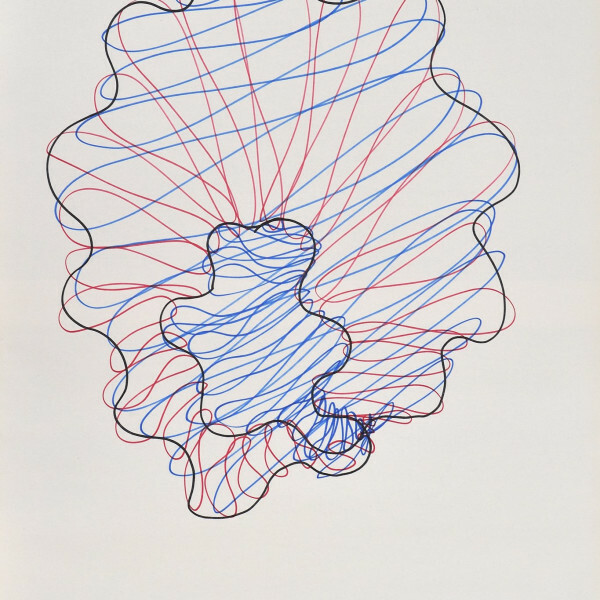 Dessin asservi is a site-resistant (as opposed to site-specific) visualization: there is no space where the drawing could indeed fit, no space that would not have a reductive effect on its centrifugal accelerations. The exhibition includes La Vigie (The Lookout Man) (2004-2011) - a monumental photographic essay in botanical situationism, surveying the growth of the particularly resilient Paulownia Tomentosa in the cracks of sidewalk and buildings in the neighbourhood of the Ministry of Economy, Industry and Employment in Paris. The images reveal an ever-changing landscape of urban gestures, from traces of children's play to the physical evidence of anti-terrorist vigilance. Also featured are Ordre en tas (Order in a Heap), relating an attempt to organize geometrically found materials and the chromatic standardization of BIC ballpoint inks; or Model for Sharing, Moulène's retort to the artificial, debilitating distinction between the 99 and 1 per cent in recent debates on economic and social justice, as well as newspaper projects such as Le Louvre or Objets de grêve (Strike Objects). ENDWARDS will be accompanied by a cinema program, curated in collaboration with film historian Gawan Fagard (University of Munich). Divided between presentations of video works in weekly rotation and five special screenings that respond to different themes in the exhibition, such as 'Archaeology' or 'Assemblage', the program includes work by filmmakers such as Kenneth Anger, Hiroshi Teshikahara, Kyle Armstrong, Patricio Guzmán, Anand Ghandi, Duncan Campbell, Clemens von Wedemeyer, Beatrice Gibson, Shahryar Nashat, Akram Zaatari and many others. The exhibition is made possible by the generous support of Galerie Chantal Crousel, Galerie Greta Meert, Middelheim Museum Antwerp, Thomas Dane Gallery and ERG Brussels. With thanks to Chantal Crousel and Marie-Laure Gilles, Greta Meert and Frédéric Mariën, Sara Weyns, Martine d'Anglejan-Chatillon, Corinne Diserens, Kris Kimpe, Marie-Céline Chevassu, Berten Jaekers, Boris van Heerden, Sofie Dederen, Chris Sharp, Yasmil Raymond and Sophie Berrebi. Jean-Luc Moulène (1955) lives and works in Paris. Presentations of his work were organized at Beirut Art Center (2013), Modern Art Oxford (2012), Dia Art Foundation, New York (2011-2012), Carré d'art - Musée d'art contemporain, Nîmes (2009), Culturgest, Lisbon (2007), Jeu de Paume and Musée du Louvre, Paris (2005). He has been featured in group exhibitions at Sharjah Biennial, CAC Brétigny, Brétigny-sur-Orge, Witte de With, Rotterdam, Venice Biennial and Documenta 10, Kassel. Moulène is represented by Galerie Chantal Crousel, Paris, Galerie Greta Meert, Brussels, Thomas Dane Gallery, London, Galerie Pietro Spartà, Chagny, and Galeria Désiré Saint Phalle, Mexico City. 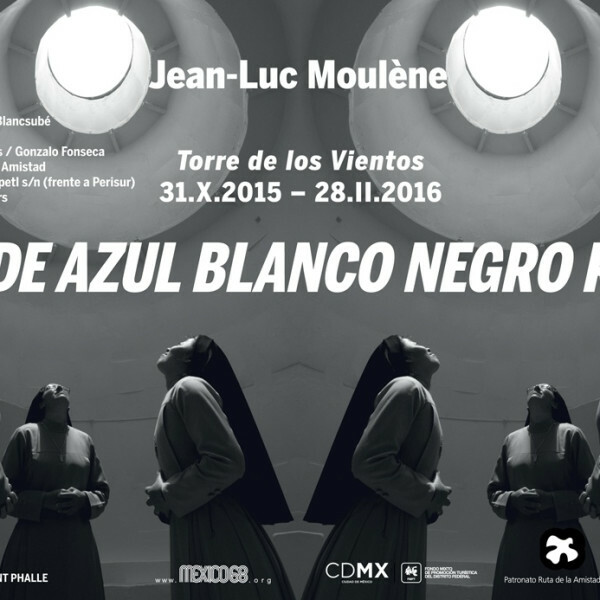 Beirut Art Center is pleased to present a solo exhibition by French artist Jean-Luc Moulène. Known as a photographer, particularly for his series Objets de grève (2000-2003) and Produits de Palestine (2002-2004), Moulène's documentary approach to photography has participated in questioning the function of the image and its politics, as well as the relations between the photographer, the subject, and the spectator. 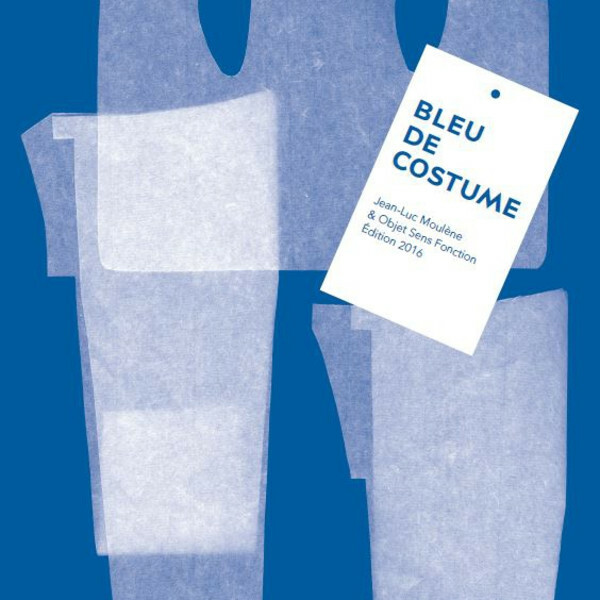 Since the late 1990s Moulène has become more and more engaged in the production of objects and drawings, reacting to the increasing dematerialization of labour. That being said, there is no definite boundary between image and object, and the artist continues to use photography as a research tool. This exhibition is Moulène's first solo show in Lebanon; yet, his experiences in the country started more than a decade ago. 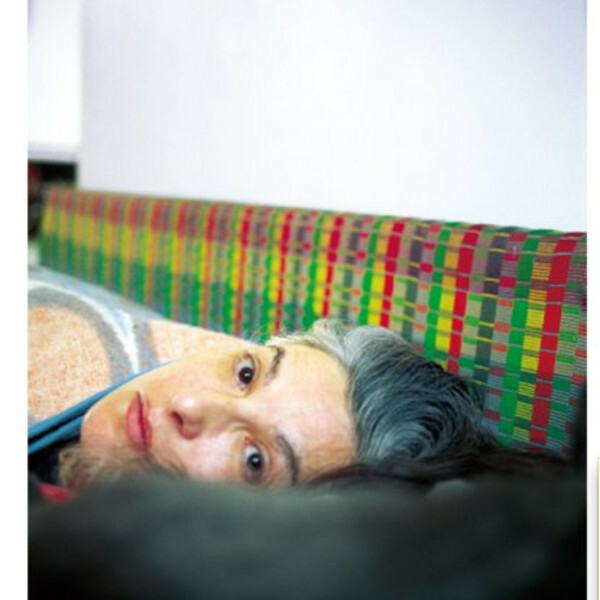 Moulène travelled to Lebanon in 1999 and 2002, producing a body of images in the city of Saida. This photographic series consists of landscapes, as well as portraits of individuals whom the artist met and got to know during his stay in the city. These images were printed in large format (2 x3 m) and hung on the walls of the old city, evoking the complex relations between private and public space, and allowing the residents to appropriate these images in a gesture of restitution. For this exhibition the artist will present works in different media, ranging from photographs, drawings with BIC ballpoint inks, objects, video, as well as a large scale structure especially produced for the show. 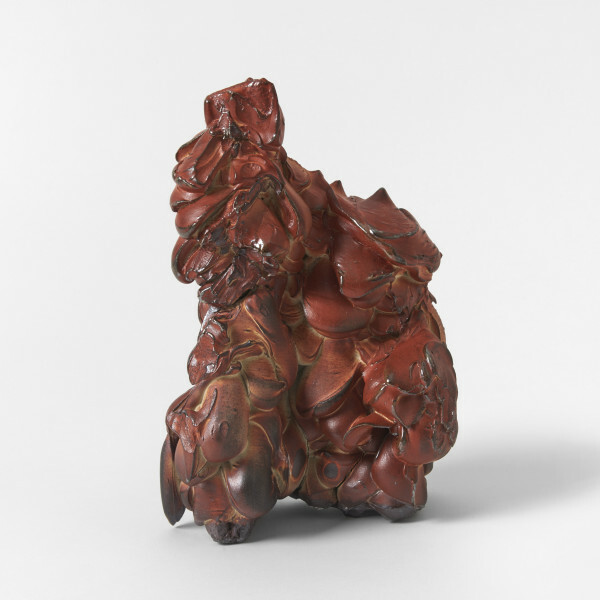 While this exhibition is not a retrospective of Moulène's oeuvre, it nonetheless includes many key works that he created at different stages of his career. The exhibition unfolds in four parts. The first presents works that share a concern with the body in relation to personal and public space. The second leads us to think about production means and processes focusing on the notion of "standard." The objects included in the third part are carefully handmade and put in dialogue with photographs considered by the artist as "documents." Finally the exhibition ends with a series of drawings and a video that make use of observations and performative gestures to rethinking the mundane. 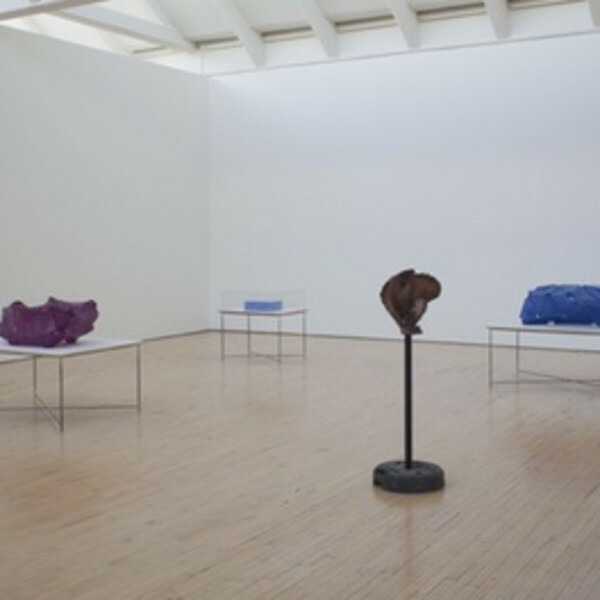 Stemming from the 1970s' notion of art as an enigma, Moulène's approach is disjunctive, dismissing clearly defined ideas and addressing multiple themes. In these exhibited works the artist confronts the viewer with the standard and the singular, as well as the performative aspect of identity formation. Moulène's concern is also "to authorize rather than to be an author," to show tensions and conflicts, affirmations and negations in the systems that govern our lives from economy to culture. The artist can be said to produce tricks for truth, or artefacts and spaces for the sake of experimentation with options and choices. In this sense, many of his works are conjugated in the future tense, pointing to a possibility, a potential for subversion that may or may not be realized. Pour l'inauguration de ce nouvel espace, une ambitieuse exposition invite des artistes contemporains des deux rives. Si toute œuvre s'inscrit dans un contexte originel et une histoire singulière, le voyage et le nomadisme qui caractérisent l'artiste contemporain constituent une expérience existentielle, qui devient le lieu même de la création. À l'ère de la globalisation, au contact de la diversité du monde et des cultures, l'identité de chacun se trouve sans cesse remaniée. Une quarantaine d'artistes issus des pays du pourtour de la Méditerranée ont été choisis sur leur aptitude à nous repenser en êtres aux identités plurielles, en perpétuel devenir, et sur leur capacité à investir le réel en une réflexion critique. Ils appartiennent pour la majorité d'entre eux à la génération née dans les années 1960-1970 et jouissent d'une reconnaissance sur la scène internationale. Parmi les œuvres exposées, dont un grand nombre de propositions inédites conçues pour l'exposition, quelques-unes traitent du paysage méditerranéen. Elles sont nombreuses à interroger les notions d'identité, de citoyenneté, du même et de l'autre. Plusieurs s'attachent à transmettre l'expérience de l'émigration, de l'exil et du déracinement. Elles offrent aussi une vision de l'histoire au présent, par le biais de l'articulation de récits personnels à l'Histoire. En prise avec les réalités sociales, politiques et géopolitiques, elles nous informent de l'état du monde.